From the cold puna (barren land) region to the warm yunga (densely wooded region), the Department of Ayacucho is at the same time, a painful memory of our recent past. However, because of its people it is also a warm memory. Thanks to its inhabitants, as well as its patrimony, customs and importance in the history of Peru, Ayacucho continues to heal its recent wounds, looking towards the future with hope. We will sketch a brief historical panorama on the basis of this broken geographical area, bordered by three rivers: Mantaro, Pampas and Apurímac and specifically on the City of Ayacucho (whose history encompasses important events of Peru´s past). The presence of Ayacucho´s first inhabitants dates back more than 15 thousand years, when groups of hunter-gatherers subsisted with the fauna in a totally different environment to the present one. The landscape underwent drastic changes between the years 10,000 and 7,000 B.C. Conditions of life were modified in such a way that a large part of the fauna vanished for good and the climate became the one we know today. 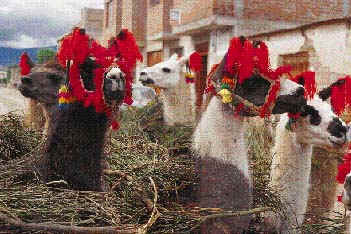 Towards the year 6,000 B.C., the initial experiments in agriculture and the domestication of camelidae were established. After having lived in caves, huts or out in the open, nomadic groups became sedentary, concentrating in towns and handling crops such as quinua, pumpkin, potato, olluco (ullucus tuberosus), mashua, oca (oxalis tuberosa), lima beans, etc. 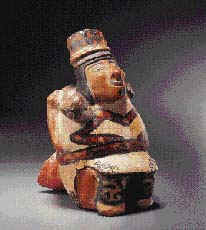 Agricultural activity was consolidated in the Andes from approximately 2,000 B.C. in what is known as the Formative period. In Ayacucho, the Wichqana, Chupas and Rancha locations, among others, belonged to this period.In this region, the first few centuries of our era correspond to the development of the culture known as Huarpa, the name given to the Cachi River along its course through the Province of Huanta, until reaching its outlet on the eastern side of the Mantaro River. The city is definitely the organisation axis of the Wari period, with a typical urban model as seen today in Pikillaqta (Cusco), Wiraqochapampa (La Libertad) or Cajamarquilla (Lima). 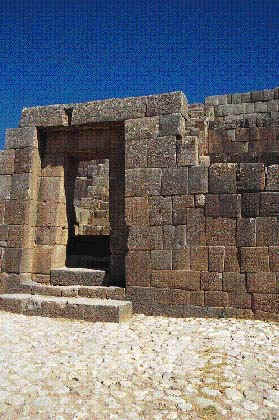 Archaeological evidence of this stage reveals institutions that were key in the functioning of the Inca state, more than four centuries later. Other pertinent information uncovered was the network of roads with state warehouses, the colonization of regions far from the city, the fortified installations in conquered territory and the displacement of the population. 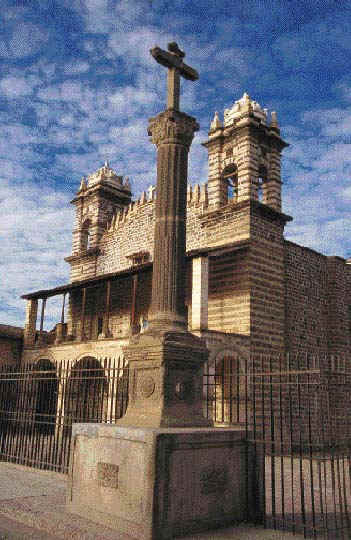 In the Ayacucho area, the nucleus of the Inca power was the administrative center of Vilcashuamán, with its impressive remains, typical of an Inca administrative center: the ushnu symbolical representation of the governing hierarchy the Temple of the Sun and state warehouses. The city of Vilcashuamán, surrounded by mitimaes groups, was created during the Spanish invasion. While the provinces of Huamanga, Cangallo, Vilcashuamán, Huancasancos, Huanta and La Mar (the northern area of the department of Ayacucho) experienced significant seizures of mitimaes groups, the southern region practically maintained the totality of its ethnic unity. 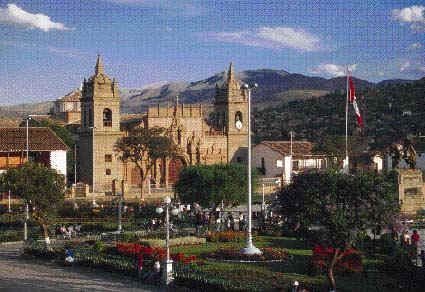 The colonial administration required a control center between Lima, the capital founded by Francisco Pizarro, and Cusco, the conquered center. Two things concerned Pizarro: the large distance between the two capital cities, and the danger of the resistance sustained by Manco Inca from the Vilcabamba area, and the Apurímac and Urubamba Rivers. These were the reasons justifying the creation of San Juan de la Frontera de Huamanga, on January 29, 1539, seven years after the invasion of the Spaniards in the Tawantinsuyo territory. The foundation of San Juan de la Frontera prevented the reuse of the Vilcashuamán Inca Center and transfered the regional government center to the north at lower altitudes. 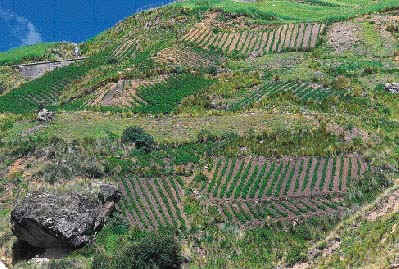 The initial foundation of Huamanga was carried out on the side of the Andean mountains leading to the yunga area of the Apurímac river. When the Spaniards arrived at these remote corners of the Andes, they could not quite grasp the organisation skills of the original and mitimaes populations, fundamental for developing taxation processes and the delivery of parcels/post connected to it. Except for the distribution of the indigenous population granted by governor Pizarro and successive viceroys, the town council was managed autonomously for the granting of common lands, farms, plots of land, market gardens and mitayos until possibilities were outgrown. Almost a century after its installation, the farms grew in importance and the land of the valleys and pastures were better distributed. The City of Huamanga was surrounded by indigenous communities who guaranteed the fulfillment of the work required to keep the city clean and to carry out further development projects. 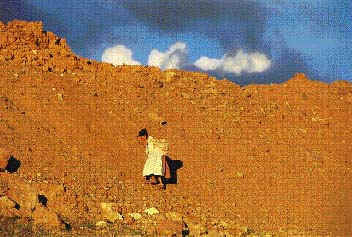 The Huamanga region experienced the impact of the Cerro de Pasco mining boom from the end of the 18th century up to the first decade of the 19th century. The locals latched on to this prosperity through the production and export of products required by the mining centers, especially coca and hundreds of thousands of yards of calico cloth and knitted baize. This production also included leather, skins, cordovan and sheepskins. The collapse of the mining industry in Cerro de Paso would have direct repercussions to the economy of Huamanga. Subsequently, the war with France would put a stop to the impulses following the success of the Spanish reforms, although it would also be the reason for the encouragement of a liberalization atmosphere by the courts in Cadiz. These liberal ideas generated the rebellion of Hurtado de Mendoza in 1814 which was soundly put down in Huanta. 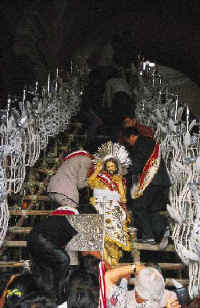 The troops of Arenales reached Huamanga following the old route of the muleteers who transported cotton, liquor and chili, from Pisco to Huamanga, after the disembarking of San Martín in the Bay of Paracas. This event will be remembered by the current name of this route, the Ruta de los Libertadores (Liberators Route), connecting Pisco with Ayacucho. Very close to where the city was originally founded, next to the town of Quinua, the patriot army abolished the colonial regime in South America on December 9, 1824. In memory of this battle, Bolívar decreed a change in name from the City of San Juan de la Frontera de Huamanga, to Ayacucho. However, the Independence Wars (and their inevitable consequences) limited the economic life of the city and the region even further. Huamanga would remain a stagnant town throughout the 19th century, almost without any significant economic growth. When the Chilean expedition of Urriola invaded the city in October of 1883, there was little to take. 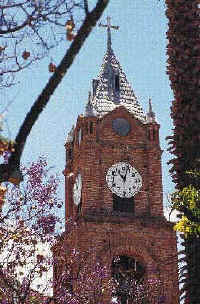 However, the city was the scene of important political events, such as the implementation of the Constituent Assembly in the Church of San Agustín, in 1881. It was during the eleven-year regime of Leguía, that the City of Huamanga largely modified its urban design with expansion works financed by the central government and carried out in a national symbolic anniversary: the Centennial of the Independence of 1924. The city reflected consequences of the growing separation from its regional space and its increasing dependency on other more dynamic centers such as Huancayo. 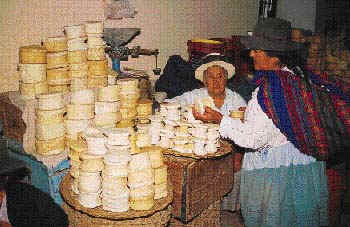 The provinces of Lucanas and Parinacochas were increasingly `overrun´ by other economic centers while Mantaro production displaced the Huamanga hats, blankets and knits. Huamanga was, throughout the first half of this century, a "dependent economic island." The 1980's was the decade of terror and death in rural areas, that compelled the compulsive migration of the peasant population and increased the city of Ayacucho´s population from 70,000 inhabitants in 1981 to the 120,000 inhabitants it has today. 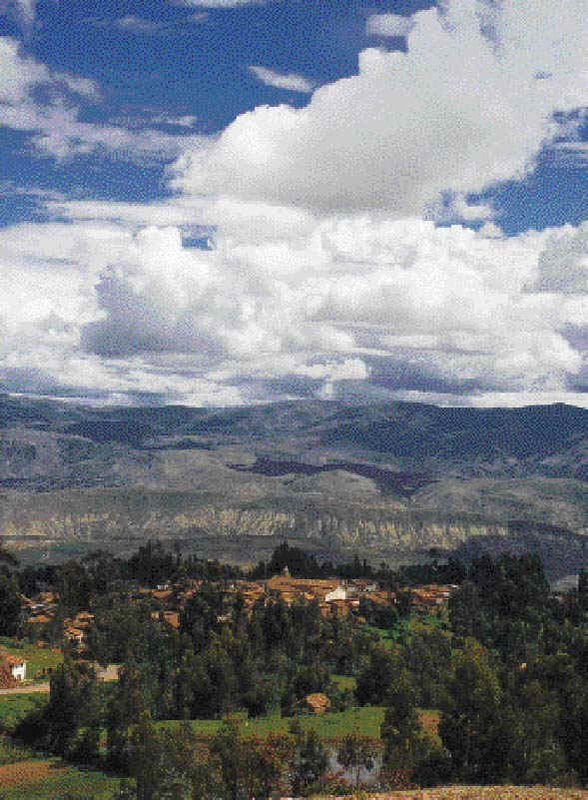 However, even though the city has grown exorbitantly, Ayacucho is the only department that has a recording of less inhabitants than in the previous census (503,000 in 1981, 492,000 in 1993). This is because the political violence increased the emigration of the Ayacucho population from all the provinces towards Lima, Huancayo, Ica and other urban centers. 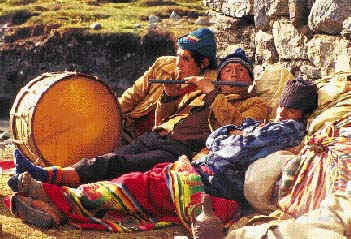 At last it seems that Ayacucho has reached a period of peace. Children are demographically the majority. Huamanga, for them, a city with notable personality, should build a future according to its past.